Central to one of the iconic views of the Hurley Flats are the two majestic walnut trees along Hurley Mountain Road south of Wynkoop. When driving south on Hurley Mountain Road and rounding a corner in the road, the trees appear, almost suddenly, on a high spot with the Mohonk Ridge on the horizon. From here, prime agricultural land stretches out across the flats, bordered by a forested mountain on the west and the Esopus Creek to the east. Some of this farmland was purchased by Henry Paul in the 1930s, not long after he and John Gill, Sr., had arrived in Ulster County to start a farm operation. This period marked the beginning of significant land acquisitions that helped establish beloved multi-generation family farms that, in many ways, defined Ulster County farming and shaped the Hurley community as we know it. 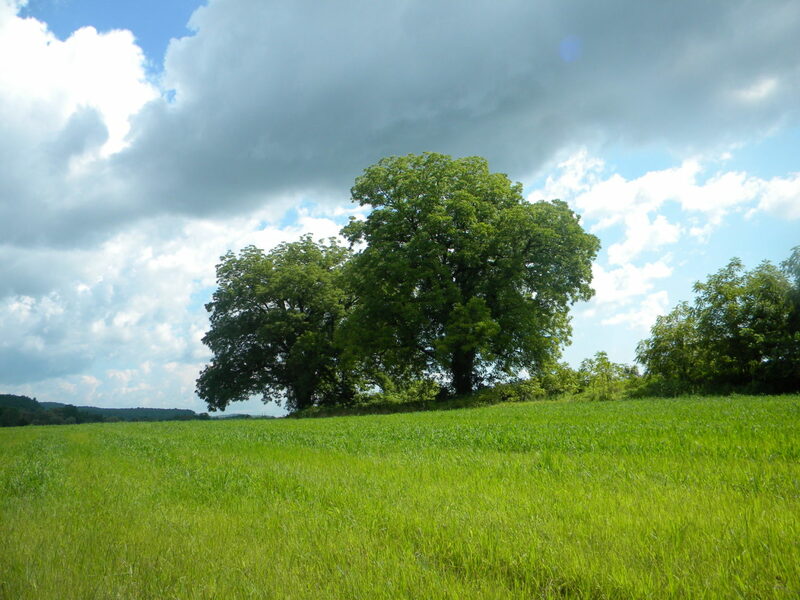 In the final weeks of 2018, after having leased the land since 2013, the Farm Hub was honored to acquire 260 acres surrounding these old walnut trees, known locally as the Paul Place. The property was farmed for hundreds of years, beginning with Native American Lenape who, long before the arrival of the Dutch in the 17th Century, grew corn, beans, and squash on the Flats. Over the course of the last century, the land was planted at various intervals in tomatoes, cabbage, corn, beans, and mixed vegetables for the Paul’s and Gill’s farm stands and wholesale enterprises. Of particular significance for the neighborhood is the agricultural conservation easement placed on the property in 2006 by the Paul Family Trust together with Scenic Hudson and the Open Space Institute. An agricultural easement is a conservation tool designed to protect property from development in a way that is specific to farming. These restrictions run with the land to permanently prohibit residential or commercial development otherwise permitted by local zoning while allowing for a limited number of structures associated with farming on carefully designated areas of the property. The easement on the “Paul” property thus ensures that the land will remain available for agriculture in perpetuity. Since the Farm Hub’s first growing season, this property has been at the center of the farm’s crop plan and rotation of organically grown grains, cover crops, and vegetables. In 2017, the decision was made by our farmers and ecology team to allow wet sections along the road to re-vegetate naturally, along with added native wetland plantings in small experimental plots. These plots are representative of the Farm Hub’s Farmscape Ecology Program’s ongoing efforts to control soil erosion in flood-prone areas of the farm and attract beneficial insects near crop fields. This spring we have been busy replacing the culvert under the old farm road which long served as an entrance for farm vehicles. As we anticipate the coming growing season and our thirty-acre vegetable production situated on part of this historic property, we are honored to call this land part of the Farm Hub. In partnership with Scenic Hudson, we are excited to steward this land into a future that includes healthy soils, food production, clean water, wildlife, and continued reverence for the beauty the place offers. The Hudson Valley Farm Hub is a fiscally sponsored project of the New World Foundation, a 501(c)3 public charity.